Now I am wondering if the tree trimmers were really qualified and if they totally hacked my lovely rich yard down to nothing but crap! I read some things about tree topping and how its bad. I am worried now that i ruined the beautiful landscape. Granted it was OVERGROWN, but maybe this guy went a little too crazy on it? I mean, I DID have beautiful flowers from the vines growing up the tree on the side. I DID have a lush private backyard. 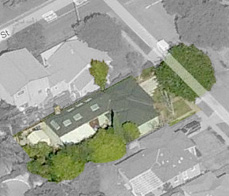 I DID have a huge, symmetrical magnolia tree in the front, that is now only trimmed on my yard facing side…wtf? I REALLY hope things grow back and I don’t question what I have done to the yard.